Long time ago, tattoos were used by ancient peoples and tribes for all kinds of rituals and rituals. Even then, instead of needles, any sharp objects of everyday life were used, for example a stone or wooden spike or tooth of some animal. But not all ideas about this art were harmless. Japan tattoo art began to denote criminalism. Although earlier tattoos could only be of the highest authorities, that is, the emperor. Often as symbols of wealth, health and prosperity on the body were pulled out flowers. Now, in the modern world, among the youth movement, a tattoo is a way of self-expression, sometimes an incentive to look like its idol. The term was introduced by an English tourist man James Cook, and the word “Tatau” from Tahitian is translated as “drawing on human skin”. Body painting from prehistoric times is considered a form of unique art, which in its turn is also divided into types and genres, so the drawing on the skin should bear a certain meaning. 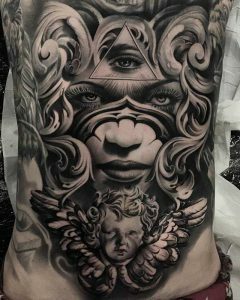 For a person, tattoo art can designate a variety of things, beginning the name of the city in which he was born, the sign of the zodiac and ending with the name of his beloved pet. For example, on the shoulder of the famous Hollywood actress Angelina Jolie, the geographical coordinates of the places where her children were born were carved out. For most young people and not only, the process of tattooing looks like something terrible and painful, and some are just afraid of making a mistake in choosing a symbol or drawing. Fortunately, for this percentage of people, so-called temporary tattoos were invented, which are applied to the skin transferring a picture from paper to the skin with water or drawing an image using a special henna paint. On average, this tattoo lasts up to 2 weeks. It can also be a way to see what the future tattoo will look like. The process of tattooing is very important in terms of safety and sterility. For this, it is best to do it in salons with a guarantee of quality and reliability. It is very important that before the action begins all the needles and instruments undergo thermal and alcohol treatment so as not to harm the health of the person. Many professionals in this field do not recommend make tattooing to people under 21 years of age, as a thoughtless choice of a sketch will accompany a person all his life’s journey. And there is not always the likelihood that it will not affect his fate or life situations, because in this art, as in all others, even the slightest, but some mystic and some kind of magic is hidden.